It is a common belief amongst the diamond buying public that diamonds are unbreakable. After all, they rate 10 on the Moh’s scale, so they must be tough, right? Unfortunately, hardness essentially refers to how well a material resists scratches. Therefore, if you put a diamond up against a brick wall and rub it, it should, in theory, resist scratches. However, what most people don’t know is that diamonds are very fragile. Whilst it is rare for a round brilliant to be damaged, fancy cuts with corners (princess, pear, marquise, heart etc) are very susceptible to damage. Funnily enough, in the past few months we’ve had two cases of cleavage plane fractures. 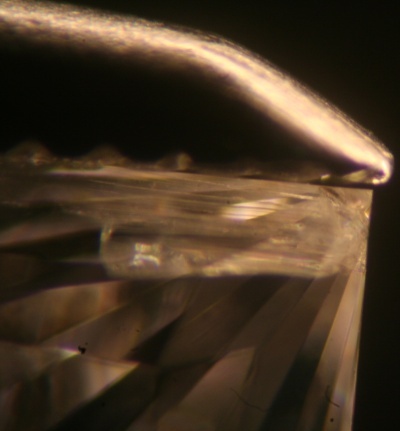 The first case, as pictured above, shows a massive cleavage plane fracture on the edge of the diamond. The story behind this one was that we sold the diamond loose, but the customer took it to a “respectable” Sydney jeweller, who did the damage whilst attempting to set it. Because it was an over-sized one carater, we took the diamond back, recut it, and still managed to keep the one carat size. As a side note, we always check our diamonds when we receive them and the again prior to shipping to make sure there is no damage to them. The second case, as pictured above, was one we received from a supplier. The certificate was dated in 2007, so we knew that the diamond had been “memo-ed around”. The diamond was a VS2, and had a feather near the corner. Whilst cleavage plane fractures look similar to feathers, we could see this fracture with our naked eye, so we knew something was definitely wrong. Upon further examination, we located the feather, which was well away from the fracture. We contacted the supplier, and they insisted that the fracture was really the feather that was in the corner. Whilst we sent it back, I’m not sure whether the stone was resold as-is, or re-cut. These two incidents were isolated, and indeed, were unlucky to happen in quick succession. One gemmologist we were talking to said that he “broke” a diamond when it fell on the floor. Whilst I don’t believe that, it is always advantageous to handle diamonds with extreme care. That said, a diamond with a crack, chip of cleavage plane fracture isn’t something to just throw in the rubbish bin. As demonstrated above, they can usually be re-polished with minimal weight loss. 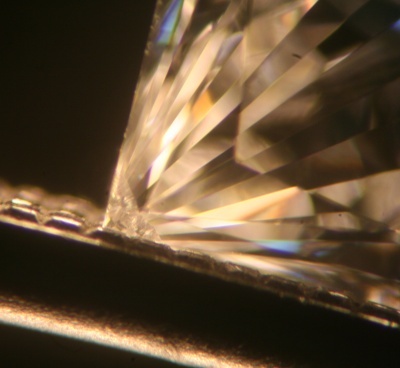 Damaged princess cut diamonds can also have their corners cut off to create a whole new look for the diamond. For a jeweller, accepting liability for damage to a diamond or gemstone that they didn’t sell is pretty much out of the question. In the first case mentioned above, the jeweller told our client that the cleavage plane fracture was a feather and that it was too risky to set. This was disappointing as it was clearly dishonest as the jeweller was trying to hide their mistake. Whilst we haven’t done any damage to any diamonds (melee excluded), I think it would be fair for the person who damages a diamond or gemstone to organise and pay for re-cutting and re-certification. This entry was written by Nikhil Jogia and was posted on on Tuesday, January 5th, 2010 at 4:41 pm	and is filed under Diamonds. You can follow any responses to this entry through the RSS 2.0 feed. You can leave a response, or trackback from your own site.